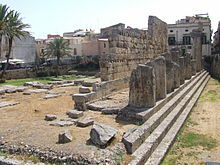 Ancient Syracuse, includes the nucleus of the city's foundation as Ortygia by Greeks from Corinth in the 8th century BC. The site of the city, which Cicero described as 'the greatest Greek city and the most beautiful of all', retains vestiges such as the Temple of Athena (5th century BC, later transformed to serve as a cathedral), a Greek theatre, a Roman amphitheatre, a fort and more. Many remains bear witness to the troubled history of Sicily, from the Byzantines to the Bourbons, interspersed with the Arabo-Muslims, the Normans, Frederick II of the Hohenstaufen dynasty (1197-1250), the Aragons and the Kingdom of the Two Sicilies. Historic Syracuse offers a unique testimony to the development of Mediterranean civilization over three millennia. This article uses material from UNESCO World Heritage List article "Ancient Syracuse", which is released under the Creative Commons Attribution-Share-Alike 3.0 IGO License.